Dr Fisher met us twice weekly in fifth year to teach us the delicate art of case-taking. We enjoyed our sessions in the chapel, firstly because he showed us how case- taking should be done, secondly because of the convivial atmosphere in which he conducted our meetings, and thirdly because the meetings were nicely leavened with anecdotes of people, ranging from Lord Dawson of Penn to shoe-salesmen. "One grows in every garden." We first came in contact with "Ted" in Fourth Year when he tried to make us realise the vast expanse of medical knowledge awaiting exploration. He was successful in impressing upon us the first principles of physical examination. His immaculate attire and swinging stride present an inspiring picture in the wards and elsewhere, adding to his fancied resemblance to a well-known film star. In fifth year, many a pleasant hour was spent at his highly instructive tutorials which were enlightened by a touch of humour and the disclosure of many interesting sidelights on famous medicos past and present. Ted Fisher enlisted in the Australian Imperial Force (AIF) on 29 November 1940. Being a physician he was appointed as a Major Medical Officer and posted to the 2/4 CCS which was formed in Hobart. The unit, being an 8th Division Unit, moved to Singapore early 1941. Whilst in Malaya he acquired an insight into tropical medicine which was to prove invaluable later. During the battle for Singapore and the retreat of the Allies down the Malayan peninsular there is little that I can find recorded specifically about Major Fisher. Suffice to note that a Casualty Clearing Station would have been flat out caring for casualties when not involved in moving the Dressing Stations (medical facilities) back towards the Causeway and eventually onto Singapore Island. In February 1942 he became one of many Prisoners of War captured by the Japanese at the fall of Singapore. In the three months between February and May 1942 he is likely to have been one of the Allied Medical Officers staffing the Allied Hospital which was set up in the Roberts Barracks. In May 1942 he became a member the medical personnel who supported the 3,000 POWs of "A" Force which was moved by the Japs to Burma to commence building the railway. "A" Force was moved in two old rust buckets (ships) the Celebes Maru and Toyohasi Maru to Burma. Along the way the ships stopped at Medan in Sumatra. Here other vessels containing British POWs captured on Sumatra joined the convoy. The ships then stopped at Victoria Point, Mergui and finally Tavoy. In each location parties of around 1,000 POWs were left. As construction of the railway preceded south, so to did the Medical Facilities move to be proximate to the POWs. By July 1943 Major Fisher was commanding the hospital (for want of a better word) at Retpu (30 km down the railway). Further moves would have been involved and it is not possible to be precise about the various locations. However, it is fortunate that Rowley Richards (Medical Officer "A" Force) in his book "A Doctor's War" published 2005 ISBN 0 7322 85321 notes "Brigadier Varley and Major Ted Fisher (who was then in charge of the base hospital at Thanbyuzayat) visited our camp on 10 February (1943) in company with Nagatomo and Lt (Dr) Higuchi, a Japanese doctor. Ted Fisher inspected the pellagra cases and agreed with my diagnosis and opinions………"
Construction of the Railway was completed in October 1943 when the line being built north from Thailand joined the line coming from the north in Burma. Then from November 1943 the bulk of the surviving POWs, and the associated Medical personnel, were moved south into Thailand. Fisher along with others was involved in the consultation process to move the sick. The initial camp for the sick/convalescents in Thailand would most likely have been Tamarkan. Fisher noted on arrival at Tamarkan (around January 1944) "disappointed, but not surprised, to find no hospital" just a working camp for 1,500 POWs. In June 1944 a large hospital camp was established at Nakhon Pathom. This was a facility to cater for 10,000 patients (it never had more than 8,000 patients). At the end of the War there were 173 amputees at this hospital. Major Fisher was one of a large number of Medical Officers (Doctors), all of whom seem to have been specialists, at the hospital. It is clear that Major Fisher was in this hospital until the end of the war in August 1945. It is recorded that at the end of the War Major Fisher was appointed evacuation officer and for seven weeks worked there until 2,238 patients had been moved, along with many others from other camps. It is fortunate that the late Rueben Boxhall (a Sergeant Clerk in the 2/4 Casualty Clearing Station and a member of "A" Force) recorded something of the qualities of this doctor in a letter he sent to me in 2003. I guess you have read the book "Behind Bamboo" by Rohan D. Rivett, War Correspondent P.O.W. on the Burma/Siam Railway. (Angus & Robertson Ltd - Sydney & London 1946). I consider this to be the best book I have read covering the areas where I was located. Pages 199 et seq deals with Thanbyzayat and Rivett refers to Ted Fisher "The Chief medical personality at Thanbyzayat was a brilliant but temperamentally difficult Macquarie St specialist with a biting tongue and a dictatorial manner which earned him the title of the "Fuehrer". Ted was unmarried and an only son. He always dressed as "regimental" as possible with a limited wardrobe albeit a better one than most of us had. Although he might have given the impression of being dictatorial to some (including Rivett who was himself a patient and perhaps expected to be treated differently because of his "status") he always had the interests of the patients as his main concern. We "jockeyed" the figures required by the Japs in an endeavour to get quinine and other items. Most patients had multiple ailments - malaria, dysentery, ulcers, a-vitaminosis etc etc. I guess Ted was a bit of a loner. I recall that some of us would sit around at night yarning about experiences at home - we had jockeys, railmen, cab drivers, farmers, clerks etc. Ted once said to me that he envied our ability to converse on a wide range of subjects whereas his life had been fully taken up with medicine and occasional theatre outings etc. We had occasional games of crib together with a couple of others. When he returned home he became Federal President of the 8th Division and Service Associates Assn which worked hard for reparations and other matters for the welfare of returned P.O.W.'s. He did this until he died. We corresponded fairly regularly until his death. I believe he had a good regard for the work I did and that he regarded me as a friend. He ranks very high in my estimation as an outstanding member of the 2/4 CCS. The unit became split up after we became P.O.W. 's and members served in different camps. Obviously, my opinions regarding outstanding people have to be limited to those I worked with but, in general, I think we all adapted to the jobs we were called upon to perform and did our best. Lt. Col. Albert Coates was probably the "Weary Dunlop" of Burma, (Refer the book "The Albert Coates Story - The Will that Found the Way" - Albert Coates & Newman Rosenthal, Hyland House, Melbourne). Coates born 1895 died 8 Oct 1977. Knighted in 1955. It is understandable but rather a pity that Weary Dunlop has been the focal point for recognition of medical services to P.O.W.'s. As a result the work of Alan Hobbs, Sid Krantz, other surgeons and physicians and medical orderlies is mainly remembered by those who benefitted from their services and escaped recognition by the media. Walter Edward (Ted) Fisher passed away 5 November 1965 aged 64. The following obituaries (reproduced with permission, from the Medical Journal of Australia) are from the people who knew him best as a Medical Officer, doing what he could for his fellow POWs. OBITUARY From Dr. C.E. Winston "No man knoweth this man." In the shadowed last hours of Friday, November 5, 1965, in the hospital which he loved beyond measure. Walter (Ted) Fisher passed to the Great Unknown. I have found it difficult to encompass his brilliant career, because he was shy, reticent, retiring, and kept so much to himself his joys and sorrows. He was born on December 19, 1901; he was an only child, his father was a citizen of the U.S.A. and his mother was a New Zealander. Ted was born in Sydney……. ….Then came the Second World War, and he spent from 1940 to 1946 with the ill-fated 8th Division. Of the part he played, both in combat and later as a prisoner of war on the Burma-Thailand railway, there are others more fitted to pen the saga. On his return from service he was awarded the Carnegie Overseas Travelling Fellowship (1946), and spent a very busy time in the U.S.A., further equipping himself with newer trends in medicine. On his return, his first loves were his public hospital work and his presidency of the 8th Division Council, which he held from its inception until his death; his private practice was largely sacrificed because of his public-spirited zeal in these two time-consuming activities. This is evident when one recalls that he was Honorary Physician and Clinical Lecturer at Sydney Hospital, Honorary Physician at Eastern Suburbs Hospital, Honorary Consulting Physician at Manly Hospital and Visiting Physician to the Repatriation General Hospital, Concord, and at Grace Building. 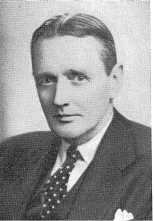 From 1955 to 1958 he was chairman of the honorary medical staff of Sydney Hospital and a member of its Board of Directors. One wonders how he found adequate time for leisure with all these activities; in this he made his mother, who survives him, his real and only love. They were both avid readers and had similar tastes in music and the arts……..
"To the casual observer he was an aloof man who always gave of his best and demanded the best from everyone with whom he came in contact; he could not tolerate sham or hypocrisy. To those who knew him better he was a staunch friend and a delightful companion, with a keen sense of humour and it was a revelation to know him. Although deeply religious, he was tolerant towards human frailties and would overlook many faults. He spared neither working time, leisure time, nor money in his single-minded endeavour to see that all ex-servicemen were justly treated, and it can fairly be said that this interest, absorbing so much of his time, caused damage to his health, and finally contributed to his death. SIR ALBERT COATES writes: "Sick and in prison he visited me." For two years, constant companions, we slept and ate alongside each other in the same hut. His conversation, when he was inclined to talk, was of a lofty order, always of interest, with penetrating observation and shrewd assessment. I admired and trusted him. At Nakompaton P.O.W. Camp, I called on him to run a committee, together with a British officer, Captain Vardy, and the Dutch Lieutenant-Colonel Larsen, to advise on the distribution of the few precious drugs supplied to us. This onerous task was to decide who, among the thousands of sick (8,000 at the camp) were to receive the life-saving medicines - since only 30% could do so. I was his patient at one period "in durance vile". Beneath a stern exterior, a heart of gold and a brilliant mind resided. My appreciation of Ted increased with the years. At times, he and his mother stayed at my home in Melbourne. Servicemen, especially the ex-P.O.W., have lost a great friend, a rock on whom many could lean. At our last meeting, when his physical deterioration was obvious, he made no complaint. Self-pity was alien to Ted. To have been his friend was a privilege. My wife and I join with his mother and his Sydney colleagues in mourning his departure……..
DR. ALAN F. HOBBS writes: I was closely associated with Ted Fisher from the time when the 2/4 Casualty Clearing Station arrived in Melbourne from Tasmania in January, 1941. Our association, he as a physician and I as a surgeon, with this unit, continued during the training period before the war with Japan commenced, then during the brief period of action and the subsequent three and a half years of captivity. Ted was endowed with a strict and dignified personality; his outstanding intellectual talent was of the greatest value in the type of work which was forced upon him. Although he detested the conditions under which we were forced to work, and his depression at times was extreme, he looked after the sick as well as was possible, with the greatest devotion both to his patients and to the nurses and orderlies who worked with him. Although his strictness led to some antipathy towards him, he always had the welfare of his orderlies and patients at heart, and this endeared him especially to the former. He did a great deal to help them in their often thankless and unsuccessful efforts. Although patients at times thought he was unduly strict, he was always fair, and woe betide the malingerer who tried to "put if over" him! Ted did not make close friends readily, but from my own experience I can say that, once made, the friendship was characterized by the deepest loyalty, and the rather aloof, dignified personality could, under the appropriate circumstances, become one possessed of the greatest charm. His work during the period of captivity, under hopeless and shocking conditions, was of the highest standard and deserving of the highest recognition. In addition to his medical work, he had a gift for administration, in which he played an important part. His dignified and even overbearing attitude to Japanese doctors, who were vastly inferior to him in all respects, is indeed something to remember. DR. THOMAS HAMILTON writes: Walter Edward Fisher, a talented physician, a good soldier and a fine citizen, died on November 5, 1965. I first met him at Brighton Camp, Tasmania, in December 1940, when he was assigned as a specialist physician with the rank of Major to my A.I.F. unit, the 2/4 Casualty Clearing Station. When I saw him rise at dawn, attend the early morning roll call and generally join with the N.C.O. 's and men in the serious business of training for war, I began to like him. We shared Cabin 25 in the Queen Mary and, later, the same huts in many camps in Malaya, during which period his sardonic comments on army life were an endless source of delight. He hated inefficiency, and he was not slow to criticize the poseur or fool, irrespective of rank. At Kuala Lumpur in 1941, he made friends with Dr. John Field and his congenial associates in the Institute of Medical Research. From them he gained an insight into tropical medicine which proved of great benefit during our subsequent tribulations in the Japanese prison camps along the Burma-Thailand railroad. There he propounded a scheme of morale-building lectures to the sick and starving men in his overcrowded hospital wards, not so much on their piteous plight, but on what the future held for them when they returned to civil life. He talked many of them into the will to survive. He followed this up on his return to Sydney, apart from a short refresher course in the U.S.A., by forming the 8th Division Council, of which he became president. He then embarked on a campaign to gain for the survivors of the prisoners of war camps the 3s a day mess allowance of which they had been deprived by an obscure army regulation. He pursued this as a matter of principle, and his perseverance and sincerity won him friends in the Federal Government, even unto the Prime Minister. Some three years later, we all received a small but welcome cheque, representing not only the mess allowance, but our individual share of a part payment by the Japanese for the notorious railroad. For this successful tilt at a windmill Fisher will be remembered. His private practice and his health suffered grievously during his time-consuming work for the 8th Division, but he was happy in the knowledge that, of all the Australian wartime divisions, it had about the best rehabilitation rate in human material. He knew this intimately, for, through the Repatriation Department, he inaugurated a five-year survey of the health of surviving ex-prisoners of war. They have lost a friend whose dedicated work for his fellow-men went far beyond the usual calls of duty. Article prepared by Lt Col Peter Winstanley OAM RFD JP by referring to a wide range of publications. The assistance of the late Rueben Boxhall (Clerk in the 2/4 Casualty Clearing Station) is acknowledged.